Our Junior Church called the Ark meets during the 10.30 Parish Eucharist each week during term time, apart from when there is a Family Service. This group is for all ages from 3 upwards. New children are always welcome and activities take account of the variation in ages. The group uses Bible-based resources and a mix of games, craft and drama to explore different topics. The group also covers other activities such as making banners for Harvest and Christmas and decorating cakes for Christian Aid. Children begin the service with family and congregation and re-join after the prayers (a little over half way through the service) and are encouraged to show their work and be an active part of the services. They come forward for a blessing during communion. These are usually on the first Sunday in the month. They are short, bright and have something for all ages. Cards with the dates for the year are kept near the Church entrance, and the dates are also on the Our Services page. At a Family Service there are lots of opportunities for involvement, with a wide range of activities, readings and drama. Our Christingle service held in early December is loved by many children and their families, as we make a circle around the church and sing Away in A Manger with candles lit on our decorated oranges. For 2017, the service is at 5pm on Sunday 10th December. The Crib Service at 3.30pm on Christmas Eve is an opportunity for many children to be involved in dressing up, telling the Christmas story, bringing up our crib figures, and singing familiar carols. With star biscuits to eat afterwards, what better way to start your Christmas celebrations! The donkey called Rocky who carried Mary down the aisle was very popular in 2016. 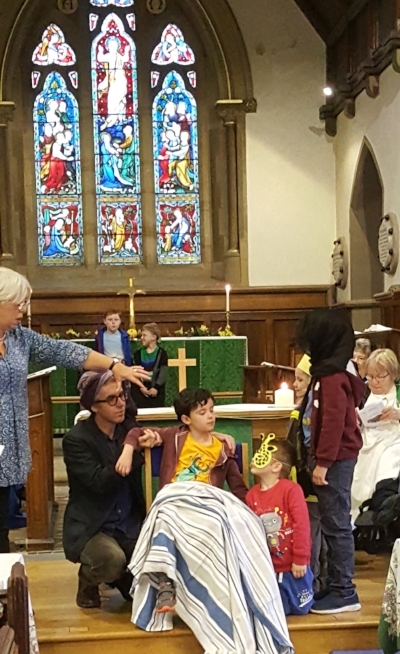 Our Good Friday morning service is a chance to join in the story of Holy Week, as we move round the Church and have a craft activity at each point. After the service the children make our Easter Garden. There is a Children’s Corner with table and chairs, toys, paper and crayons and a library of children’s books. Baby changing facilities are available in the Parish Room next door. We are happy for your children to be in church during the service or to use the Parish Room is they prefer. The children also have the opportunity to sing together at special occasions, such as the 2016 Carol Service. Here is a picture of the choir practising. Looking for somewhere to take your baby or toddler? Would you like to meet other parents and children? Why don’t you give us a try? We have a variety of toys, craft activities every week, refreshments for children and grown-ups, singing at the end of each session. You can find us in our Parish Room at St. Thomas Church. Please join us – you’d be very welcome! St Thomas’s has a long history of association with Guides and Brownies. There are currently two large and enthusiastic Guide groups and one Brownie group. These are enormously popular in the parish and the town.